Posh's second consecutive defeat meant they dropped to third in League One, while Yeovil climbed to 13th. "It was a super goal and that's his skill, He's a very good dribbler. It was a great little slalom dribble and a real fitting finishing. "He's got a lot of ability. When he came to us he needed a little more fitness and a little more work ethic, and he's certainly trying very hard to do that. "He's getting his fitness. He's only just come back from a long-term injury and we had missed him but he has to make sure he keeps being in that team. "Every single person in that team today affected the game and everyone put in that 100% that's needed to win football games." Match ends, Yeovil Town 1, Peterborough United 0. Second Half ends, Yeovil Town 1, Peterborough United 0. Nathan Ralph (Yeovil Town) wins a free kick in the attacking half. Goal! Yeovil Town 1, Peterborough United 0. 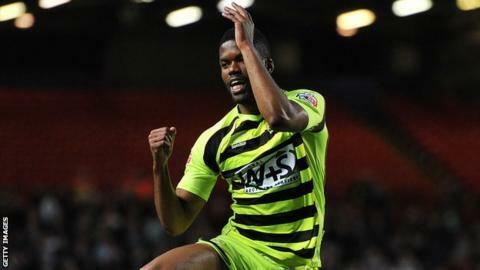 Joel Grant (Yeovil Town) right footed shot from very close range to the bottom left corner. Assisted by Nathan Smith. Corner, Peterborough United. Conceded by Seth Nana Ofori-Twumasi. Substitution, Peterborough United. Grant McCann replaces Jack Payne because of an injury. Corner, Yeovil Town. Conceded by Michael Smith. Attempt saved. Marcus Maddison (Peterborough United) left footed shot from the left side of the box is saved in the centre of the goal. Substitution, Peterborough United. Luke James replaces Kenneth McEvoy. Attempt missed. Aaron Martin (Yeovil Town) header from the left side of the six yard box is close, but misses the top left corner. Corner, Yeovil Town. Conceded by Ben Alnwick. Attempt saved. A-Jay Leitch-Smith (Yeovil Town) right footed shot from the left side of the box is saved in the centre of the goal. Corner, Yeovil Town. Conceded by Joe Newell. Corner, Yeovil Town. Conceded by Ricardo Santos. Attempt missed. Kenneth McEvoy (Peterborough United) right footed shot from the centre of the box is close, but misses to the left. Attempt missed. Joe Edwards (Yeovil Town) right footed shot from outside the box is close, but misses to the right.